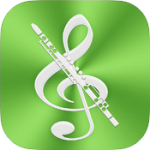 Flute Melodies is the app for sweet flute players and students. Do you want to learn some melodies?. With Flute Melodies you can learn which notes are played and how to make them while hearing the melody. – Hear a song, learn which notes are played and how to play them.